Here at Central Davis Dental we are proud to offer dental care for the entire family. We serve all areas of Davis County including Layton, Kaysville, Clearfield, Syracuse, and Roy. Our services include simple to major cosmetic procedures, orthodontics through our revolutionary Fastbraces® system, oral surgery (including wisdom teeth extractions! ), root canals, and of course preventive care. Here are a few commonly asked questions we hear to help you decide if our office is right for you. We accept patients of all ages! We love to have children visit our office, our team is trained in working with even the youngest of children, in fact many of the children we see are coming for their first ever dentist appointment! We also have a special Kids Korner for kids who visit our office equipped with toys, coloring supplies, books, and a TV where your kids can enjoy a G rated movie while they wait for you to see the dentist too! And of course we send each child home with a prize from our treasure chest after their visit so they’ll look forward to each time they come to the dentist. We accept almost every insurance plan out there! Take a look at our insurance page to see if your family’s insurance is one we accept. We also accept every form of payment including Care Credit™ to help you with any associated charges. It is our goal to help each of our patients receive affordable, high quality care. Some dental procedures, depending on the extent of work needed, can be expensive and insurance may not pay all that is required or anything at all. In these cases we offer Care Credit™ as a form of payment. Care Credit™ is a line of credit you can use for treatments and procedures at many different specialty areas including veterinary, LASIK and vision, hearing, and of course dental! The best part is Care Credit™ has options for 6 to 24 months no interest with a minimum purchase of $200 so you can pay same as cash for up to two years! We are more than happy to help all of our patients who are interested in Care Credit™ to apply and break down costs per month to help with dental costs. For more information on Care Credit™ or to apply visit www.carecredit.com. We are proud to offer a wide range of services for all of your family’s dental needs. We don’t just stop at general dentistry, in fact Dr. Harmon is skilled in many different procedures to help make going to the dentist easier for everyone in your family. Don’t run around town taking kids to different offices for their orthodontics or having to see an endodontist for your root canal, we can take care of you all in one spot! 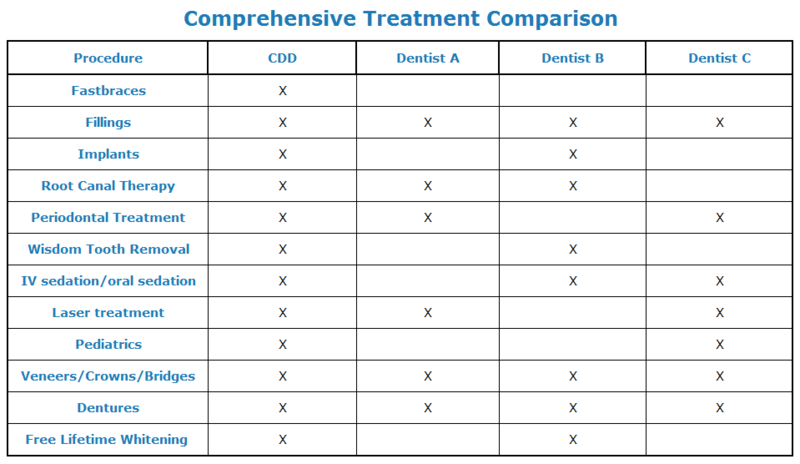 Take a look at our comparison chart to see how we stack up against other dentists in our area. We strive to make each visit as comfortable and easy as possible. We have state of the art equipment that are always up to industry standards, comfortable chairs, and some neck pillows and blankets to help you relax while you’re here. We also have ceiling TV’s and headphones in each room with over 50 channels to choose from to help your visit go by a little faster. We know life is busy, that’s why we’re committed to giving quality care in a timely manner to help you get in and out and on your way. Our staff is always here to help, feel free to ask us anything and we’ll do our best to accommodate! Take a moment to browse our procedures page to see what we can offer your family. We look forward to caring for your family at each stage of life and hope to be the office you continue to bring your family to throughout the years.